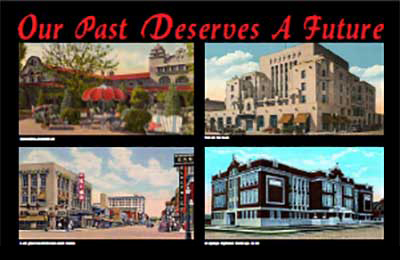 Thought provoking words and images regarding Central Avenue/Route 66, shared by Michael L. Dickson. The CCG (Concerned Citizen’s Group) prepares a point by point response to the City’s “Mythbusters” document regarding the ART project. 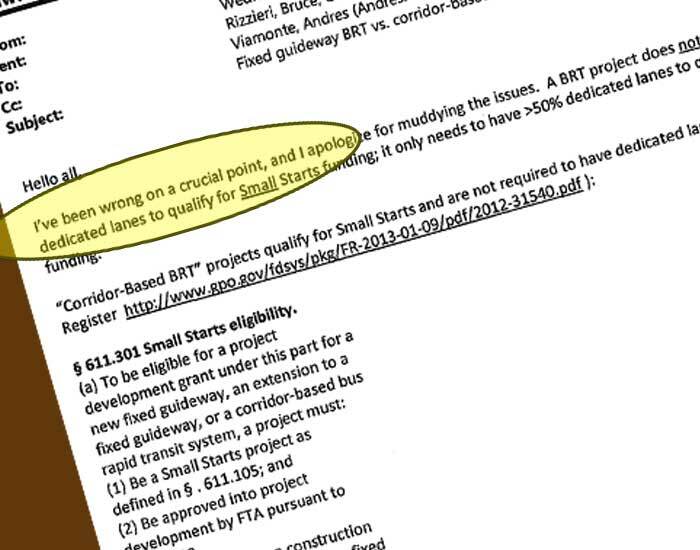 …a recently discovered email from their Planner, dated February 14, 2014 (before the plans were even 10% complete), clearly shows that they knew they had the option NOT to design the streets with double dedicated bus lanes. 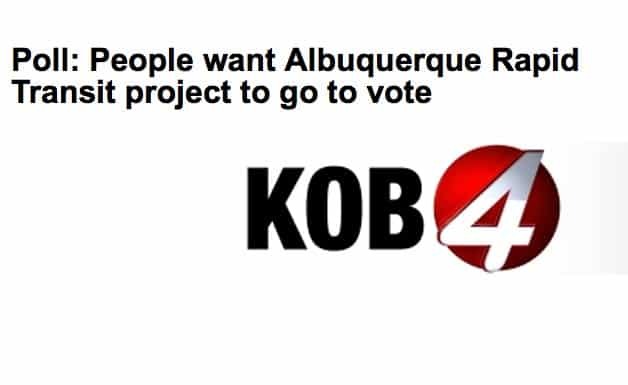 Over 400 registered voters were asked questions regarding the Albuquerque Rapid Transit project and 56% opposed the project, with another 15% undecided. The article goes on to say that 78% of respondents thought that the project should be put to a popular vote. 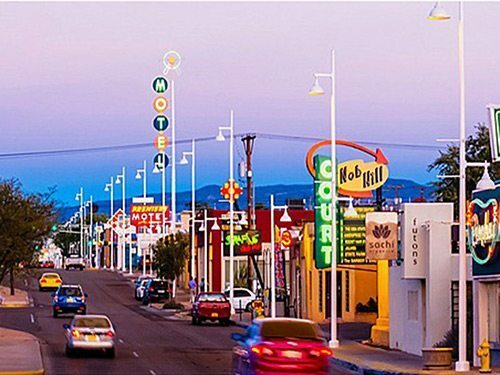 Celebrated photographer Robert Reck illuminates the simple beauty of Albuquerque’s endangered Route 66/Central Ave. 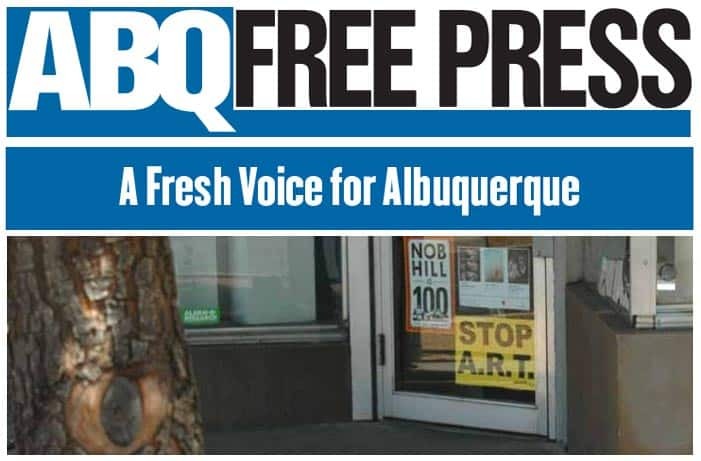 The ABQ Free Press reports on the continued setbacks for the Mayor and leaders of the disputed Albuquerque Rapid Transit (ART) project. 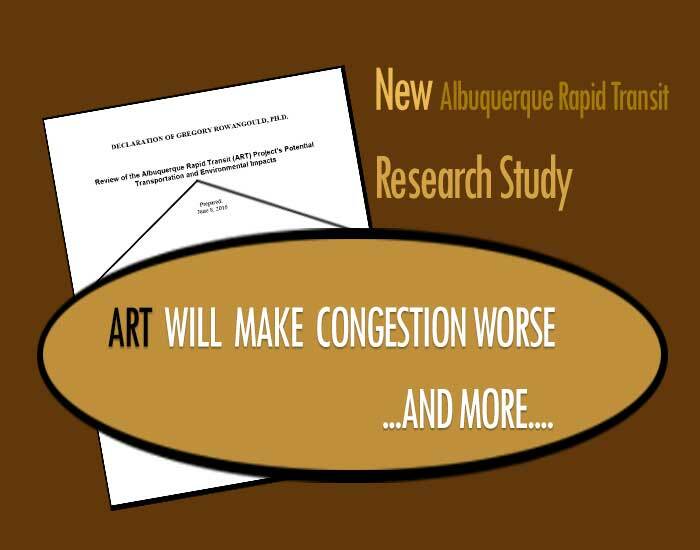 A new research study supports the conclusion that traffic congestion along Central Avenue will be significantly worse if ART is built. 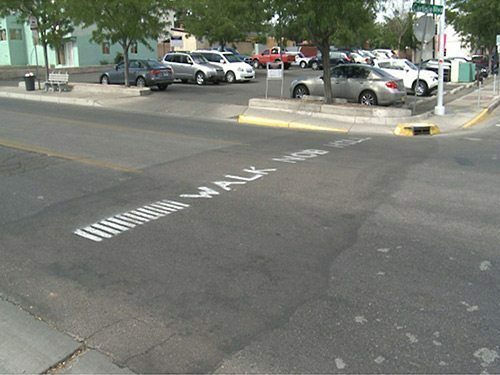 Albuquerque, don’t let ART steal our streets! We believe that a Bus Rapid Transit System can and should be designed as a Complete Street, with the entire street, its businesses and its people as the most important considerations of its design. The ART design considers the needs of the buses first, instead of the needs of its people. 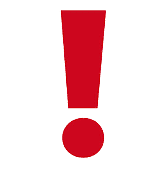 Let’s flip that thinking – people first and buses last! 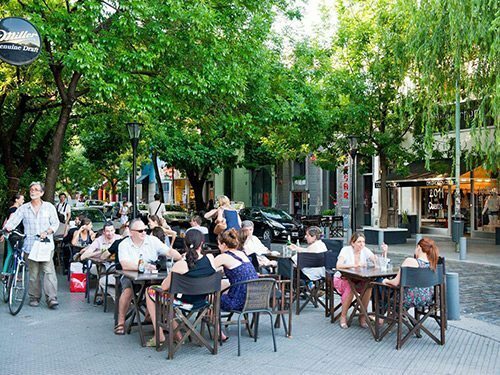 Let’s ask for – demand – what we want – and so desperately need – beautiful streets for everyone! 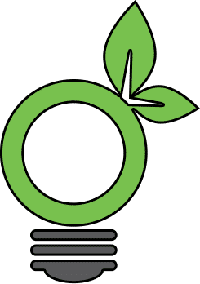 Make ART Smart is an unfunded group of volunteer concerned citizens who are professional architects, planners, attorneys, and business/community leaders. 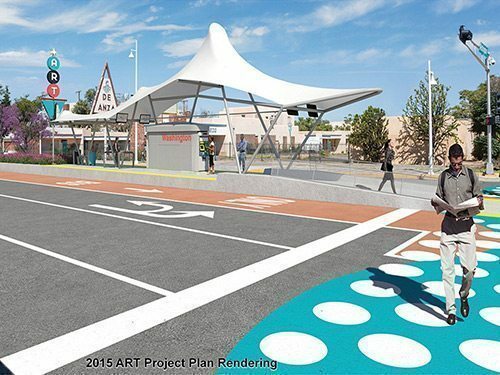 Make ART Smart volunteers came together on the behalf of all citizens and stakeholders who care about and are effected by the impact of this huge project on Route 66/Central Ave. Our mission is to make sure the design of Albuquerque’s proposed bus rapid transit system is aligned with preserving the charm and vibrancy of the most important historic segments remaining along Albuquerque’s Route 66 – Nob Hill, UNM, EDO and Downtown. Make ART Smart is dedicated to informing the taxpayer public and providing useful and detailed information about ART. 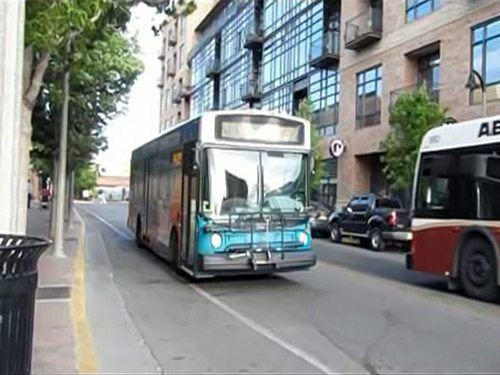 We support a well-designed bus rapid transit system IF it supports and enhances the character and functionality of our most valuable, historically sensitive areas. What will ART make Central Avenue really look like? Drag the slider below each sketch to see the difference between the existing condition and what it will look like once the ART project is complete. Drag the slider to the right to see the Existing Condition. Drag to the left to see the ART Plan. 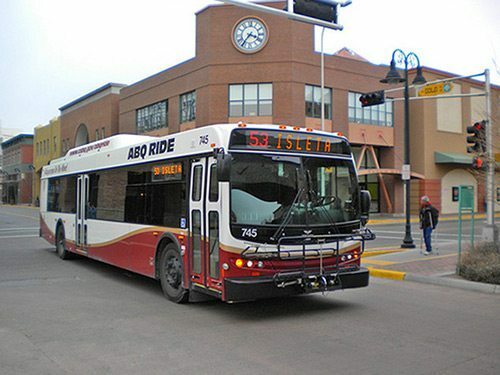 CURRENT CONDITION: RAPID RIDE AND RT 66 BUSES PRESENTLY STOP IN FRONT OF THE SPECIAL COLLECTIONS LIBRARY. ART PROJECT PLAN: ALL EXISTING TREES WILL BE REMOVED. THERE IS NO PROVISION FOR WIDER SIDEWALKS OR STREETSCAPE ELEMENTS. 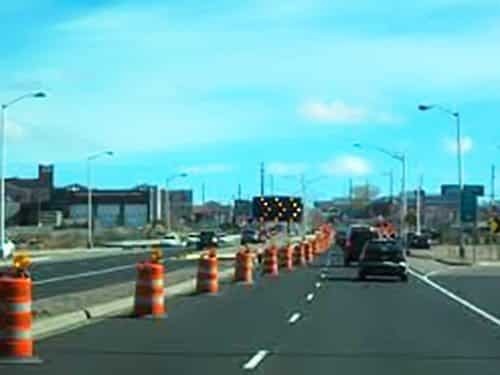 SINGLE EAST AND WESTBOUND LANES WILL ACCOMMODATE RT 66 BUSES AND ALL OTHER VEHICLES. DIESEL BUSES ARE INDICATED. CURRENT CONDITION: SPARSELY LANDSCAPED. ONLY MEDIAN PROVIDES TREES. ART PROJECT PLAN: NO LANDSCAPE OR STREET IMPROVEMENTS INDICATED. 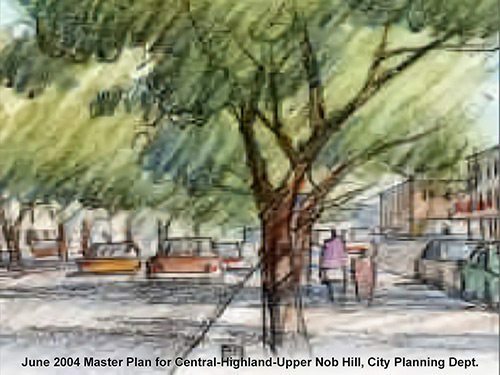 ART PROJECT PLAN: ACCORDING TO CABQ PLAN DRAWINGS – ALL MEDIAN TREES ARE REMOVED IN THIS LOCATION WITH NO LANDSCAPE SUBSTITIONS SHOWN. (THIS IS PREDOMINANT THROUGHOUT MOST OF NOB HILL). 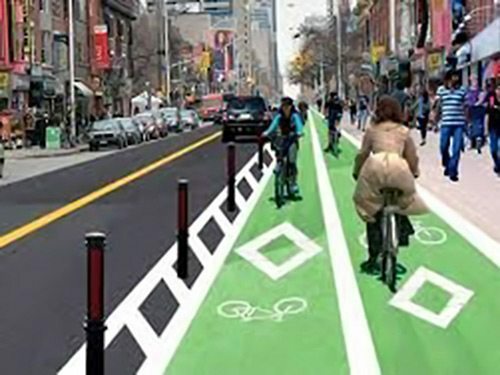 NO BIKE LANES ARE SHOWN. SIDEWALKS ARE NOT WIDENED EXCEPT FOR A FEW BLOCKS WEST OF SAN MATEO. NO SPACE FOR EMERGENCY RESPONDERS IS PROVIDED. INCREASED CAPACITY FOR WATER DRAINAGE/RUN OFF IS NOT SHOWN. DIESEL BUSES ARE INDICATED. 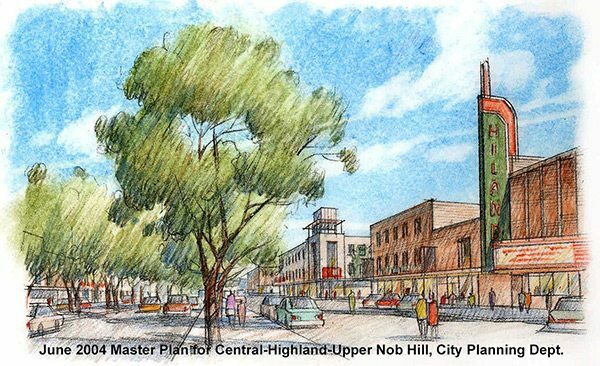 Our architects’ study of the ART plan reveals significant changes to the streetscape many ways. Let’s take a look these and other components illustrated in the details of the study. RIGHT OF WAY: Existing right of way width changes along Central Avenue. REVERSIBLE LANES: Areas where the ART buses will be restricted to a single lane for both eastbound and westbound service. This presents scheduling problems with potential delays if a westbound bus would have to wait for the eastboud bus to pass before proceeding, and vice versa. PARKING SPACES: 194 parking spaces would be lost as a consequence of ART. TREES: Approximately 217 existing mature trees would be cut down to accomodate ART. INTERMITTENT BIKE LANES: This shows where bike lanes would be interrupted due to the restricted right-of-way along Central Avenue as a consequence of ART. 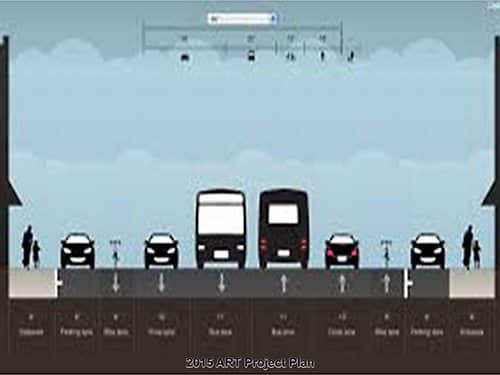 TRAFFIC SIGNALS: From the ART Project plan drawings, 10 new traffic signals would be added to the 32 signals that currently exist on Central Avenue for a total of 42 signals on the 9-mile total Project length. LEFT TURNS: Approximately 241 left turns would be lost, which would severely restrict business accessibility on Central Avenue. This number includes left turns for westbound and eastbound traffic. RECOMMENDED DESIGN CONFIGURATION: From Lomas to San Mateo, use same ART Rapid Transit buses, sidewalk access, retains all medians, keeps most of parking, expands pedestrian area. 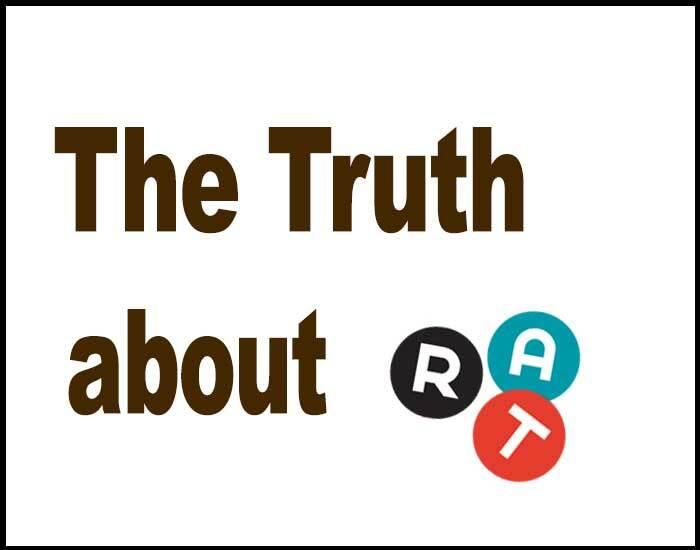 Money saved can extend ART to Unser and Tramway within present budget. 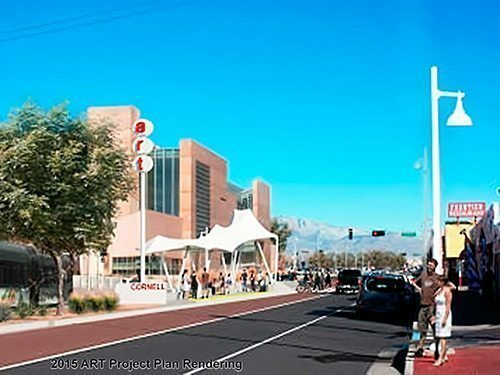 Based on our analysis, Make ART Smart does not believe that ART will contribute meaningful pedestrian, bicycle, and street improvements to the Nob Hill, UNM, EDO and Downtown segments of Route 66/Central Ave.
ART’s design will increase congestion and decrease pedestrian safety in many segments. In fact, Make ART Smart believes that most of Central will look much the same – except for less landscape and more buses. 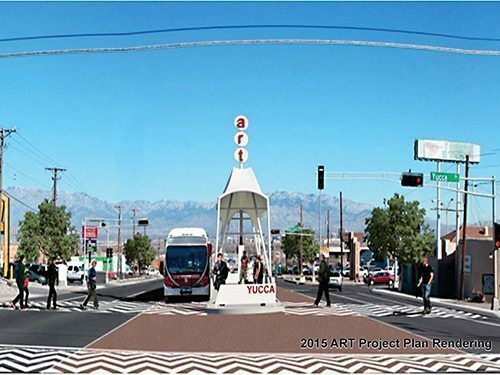 ART COULD AND SHOULD BE A CATALYST FOR A BETTER, MORE VIBRANT ROUTE 66/CENTRAL AVE! 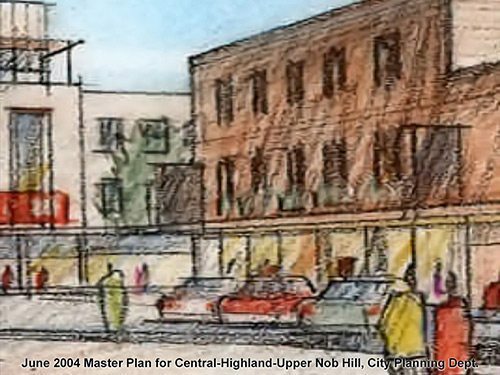 What does the historic corridor need in order to thrive/survive? Based on our analysis, ART does NOT widen sidewalks except in just a few areas of low pedestrian significance. Bicycle lanes are not contiguous and inconsistent. The ART Plan design must reflect the promises listed above. If we are to tear up Route 66/Central for years, disrupt its businesses and neighborhoods, then ART must provide meaningful change. It must fulfill our community’s need to preserve its history while building a more modern infrastructure along its route. ART should and could be the catalyst of progress – for all! What Did the Image of ART Make YOU Think Of? CONCERNED CITIZEN’S PROPOSAL SHOWS THE SAME INTERSECTION WITH LANDSCAPE AND TREES DEFINING THE CHARACTER AND PEDESTRIAN NATURE OF THE DISTRICT. EXISTING STORM INLETS MAY NOT HANDLE INCREASED RUN OFF OF ART DESIGN. ELECTRIC BUSES ARE INDICATED. 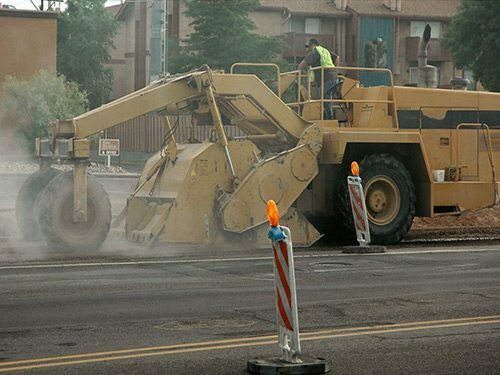 NEW ROW OF TREES TO PROTECT AND SHADE SIDEWALKS WILL FORM A CONTINOUS LANDSCAPED EDGE OF UNM’S CENTRAL CAMPUS FROM UNIVERSITY TO GIRARD BLVD. NO PROPERTY WILL BE TAKEN FROM HISTORIC AND BEAUTIFUL “TIGHT GROVE” AREA LOCATED AT SW CORNER OF THE CAMPUS. CONCERNED CITIZEN’S PROPOSED DESIGN FOR NOB HILL SHOWS WATER RUN OFF VOLUME AND VELOCITY REDUCED. BIKE LANES CAN BE USED BY VEHICLES IN SINGE LANE TO ALLOW EMERGENCY RESPONDERS TO PASS. 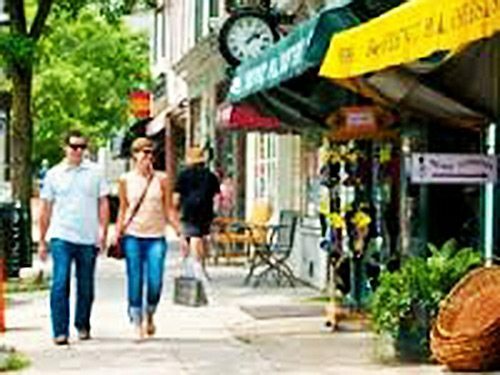 LANDSCAPE DEFINES THE SHOPPING AND PEDESTRIAN CHARACTER OF THE DISTRICT. ELECTRIC BUSES ARE INDICATED. We believe that a Bus Rapid Transit System can and should be designed as a Complete Street, with the entire street, its businesses and its people as the most important considerations of its design. The ART design considers the needs of the buses first, instead of the needs of its people. Let’s flip that thinking – people first and buses last! 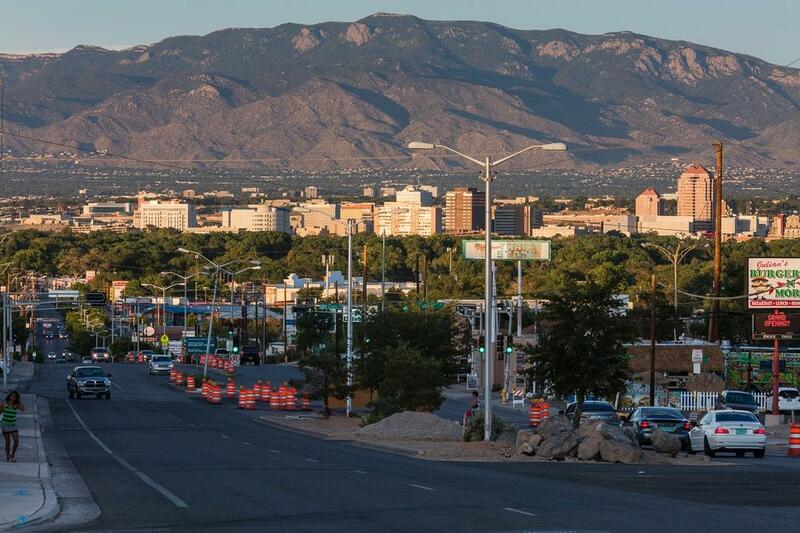 Neighborhood and business associations and thousands of individuals have been begging the City for years for improvements that promote walkability in Nob Hill, UNM, EDO and Downtown. The City has spent many thousands of dollars on studies by experts such as Moule, Polyzoides Architects, Jeff Speck and Robert Gibbs. Let’s incorporate more of their ideas into ART – instead of working from the bus center lane out, let’s work from the sidewalk in! Let’s make sure we get the most from what we, the taxpayers are going to pay for. Let’s make sure that the sacrifice that many small businesses will be forced to make is worth the price. 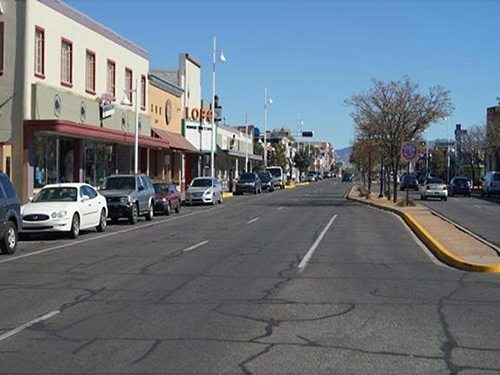 These historic segments of Route 66/Central Ave. could be greatly enhanced OR choked by buses. They could become desirable, wonderful places that people and businesses would be attracted to OR barren, bus dominated wastelands too difficult and not worth the trouble to access. We owe it to ourselves to make sure that ART contributes to enrichment of these historic areas.